Peel and devein the shrimp. Place in a bowl and sprinkle with salt and pepper. In a large and heavy sauté pan set over medium-high heat, let the butter melt. Once it starts to sizzle, add the garlic; stir and cook for 10 to 15 seconds, until it becomes fragrant. Incorporate the shrimp, making sure that the pan is not overcrowded, and let them brown on one side and then the other, for about 1 to 2 minutes per side. Don’t let them overcook; they should be browned on the outside but barely cooked through. Add the tequila, and slightly tilt the pan over the flame to ignite it. Let it cook until the flames disappear. Stir in the cream and the chipotle sauce (and the seeded minced chile if using). Serve immediately, with the chives sprinkled on top. Pati, I think this is my favorite of your recipes. 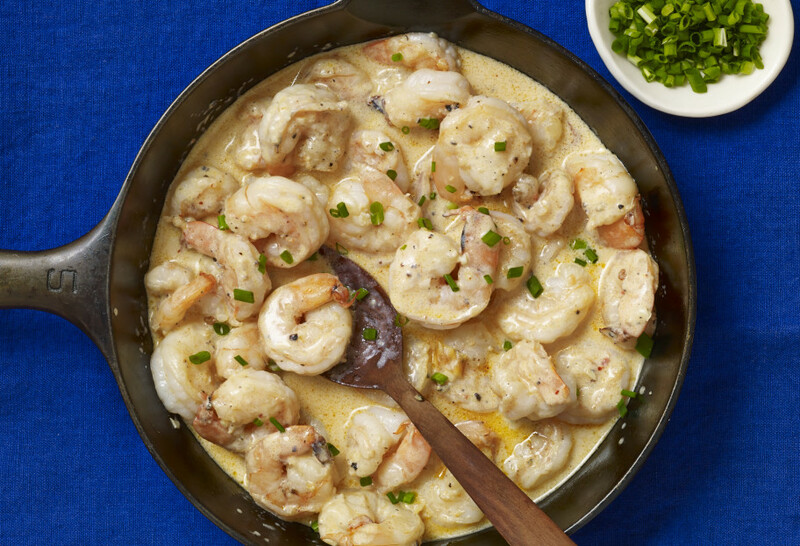 I have a tip…this is AMAZING made with Argentine red shrimp. Have to cut back a bit on cooking time, but the sweeter flavor of the shrimp takes this dish to a level I didn’t think was possible. Very good with homemade corn tortillas. Oh thank you for the suggestion, Jamie! I thought it was fantastic. I will make it again. I lost this episode that I recorded. Where is the tequila drink recipe the bartender made with the Velvet Filarmo? Hi Pati. Looking forward to making several of your very interesting recipes from your TV series. Specifically I will try the avocado cream first. When I shopped for the Mexican crema I found both sour cream and table cream as Mexican crema. I think I know the difference each will make but would you tell me which one you use when you say Mexican crema? There are more recipes that use Mexican crema and I think knowing which one you use could be important to know. This recipe was a smashing success!! In my house, we usually love a cilantro lime shrimp I make but this blew everyone away…I even made them camping in Canada this summer and all of my relatives were incredibly impressed. Would go great with a poblano potato salad, rice, ANYTHING! I’d eat these for breakfast! You made them while camping…awesome! So glad your family loves them. Can I serve this over Linguini or Angel Hair pasta? It’s wonderful over any pasta! Can I skip the tequila? This sounds absolutely amazing! I’m so glad I stumbled upon this recipe. So simple also. Thanks for the great recipe. Yay! Hope you enjoy it Danielle. What do you eat them with rice? Pasta? I would love to hear your suggestions. I can’t wait to try it. Simone you can try rice or warm corn tortillas.